We first analyzed the bond market view of the Commonwealth of Puerto Rico on December 12, 2013 and then again on January 28, 2014. Since then, the drama surrounding the Commonwealth of Puerto Rico and its ability to obtain financing has continued to rise, highlighted by this note from Cate Long on Puerto Rico's debt ceiling and this CNBC commentary by Bill Gross saying that Puerto Rico will not default. 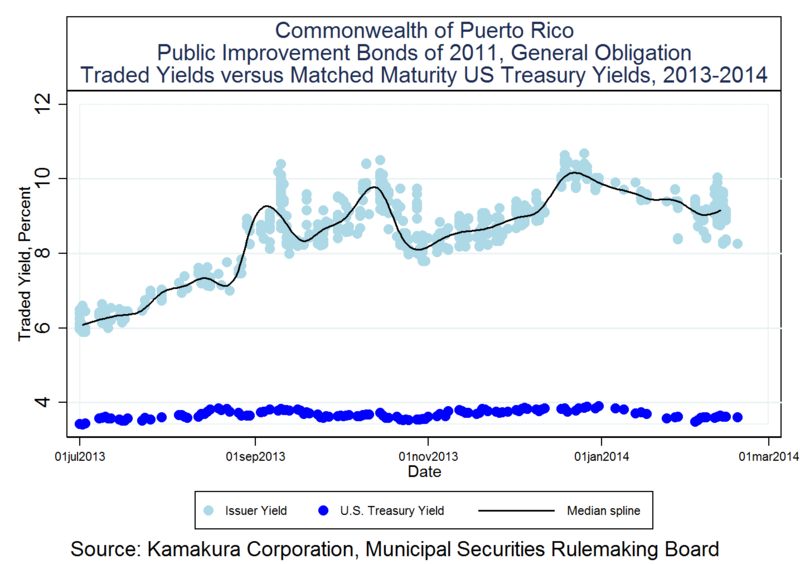 There is wide-spread unease about the holding of Puerto Rico bonds in municipal bond mutual funds. 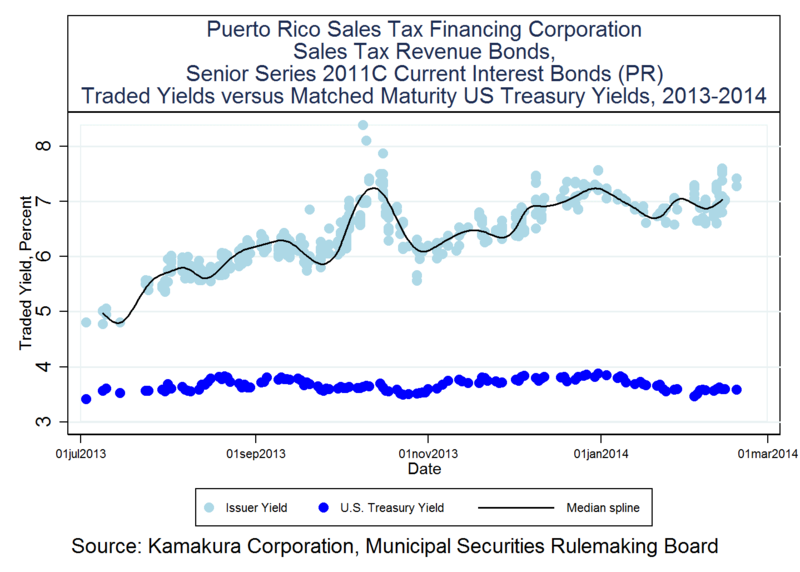 In this analysis, we update the current market view of two key Puerto Rico bond issuing entities and show how that view has evolved since June 1, 2013, with a particular focus on trades since January 28, 2014. We note that the credit default swaps of Puerto Rico have never traded according to the data provided by the Depository Trust & Clearing Corporation, so the bond market is the dominant source of information on the market's view. We find that spreads on both classes of Puerto Rico bonds are showing a higher level of trading activity and more volatility. 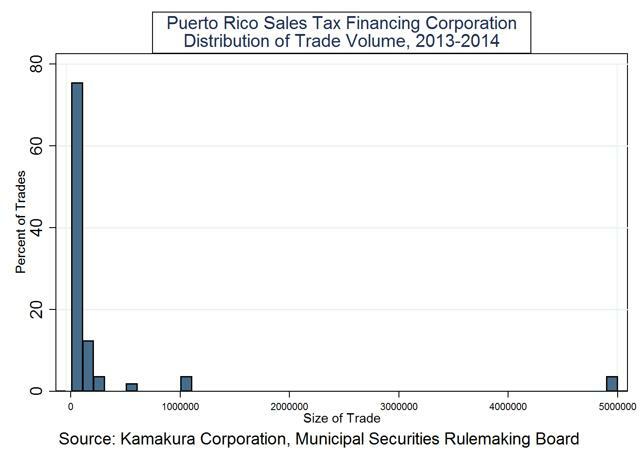 Trading is still dominated by trades of $1 million or less, a conclusion based firmly on traded bond prices recorded on the EMMA website of the Municipal Securities Rulemaking Board. Only extremely well-informed investors should be trading the two bond issues described below. The original issue documentation and current financial information is available from the EMMA website of the Municipal Securities Rulemaking Board ("MSRB"). Although some of the bonds issued by the Commonwealth on the same date (July 12, 2011) were insured, the 5.75% bonds due July 1, 2041 are not covered by that insurance. The documentation for this bond issue is also available at the EMMA website of the MSRB. We now turn to the market's view of both bonds. The MSRB website EMMA includes recent trading activity on a vast array of municipal bond issues in the United States. 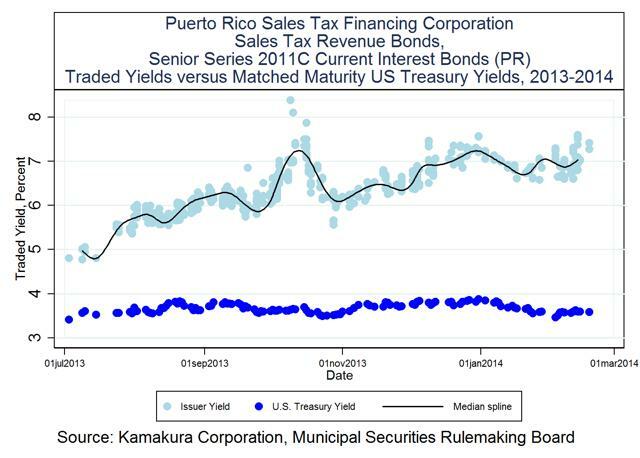 We use that data to derive the credit spreads of the 5.75% bonds due 2041 issued by the Commonwealth of Puerto Rico and the 5.25% bonds due 2040 issued by the Puerto Rico Sales Tax Financing Corporation. From June 1, 2013 through mid-day February 18, 2014, there were trades for a total principal value of $370.1 million of the 5.75% Commonwealth bonds due 2041. 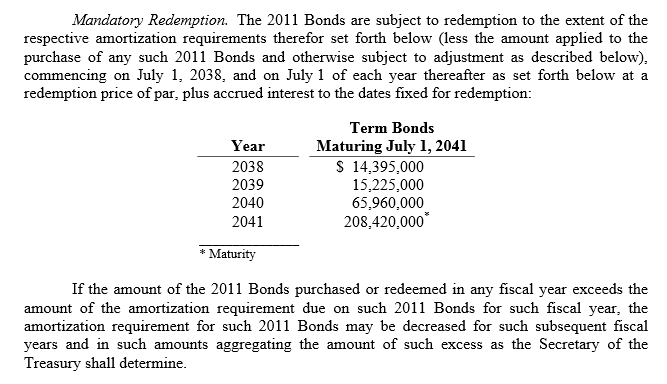 This is more than 120% of the total principal amount of these bonds. The average trading volume per day during this period was $2.5 million, with a high of $81.8 million per day and a low of $0. 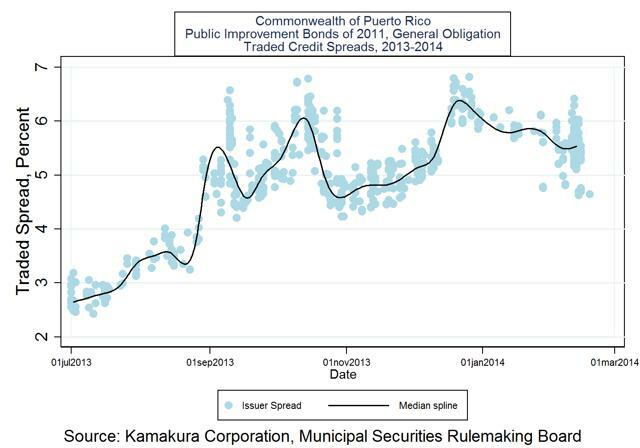 We remind the reader that there were zero transactions in the credit default swaps of Puerto Rico during the same period (source: Depository Trust & Clearing Corporation and a recent analysis by Kamakura Corporation). For the 5.25% bonds due 2040 issued by the Puerto Rico Sales Tax Financing Corporation, there were trades for a total principal value of $632.5 million. 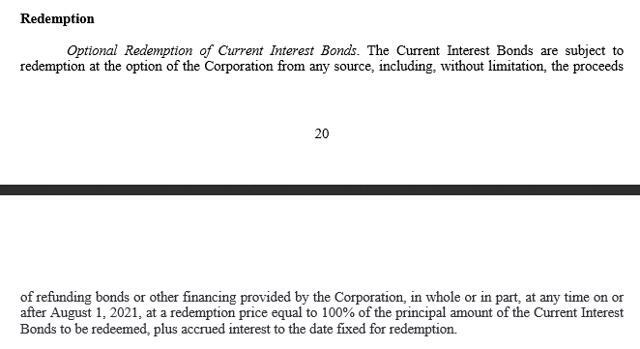 This is more than double the principal amount of the bonds outstanding. The average trading volume was $4.4 million per day, with a high of $97.3 million and a low of $0. Between the two bond issues, trading averaged $6.8 million per day and the total trading volume over all days was $1,002 million. 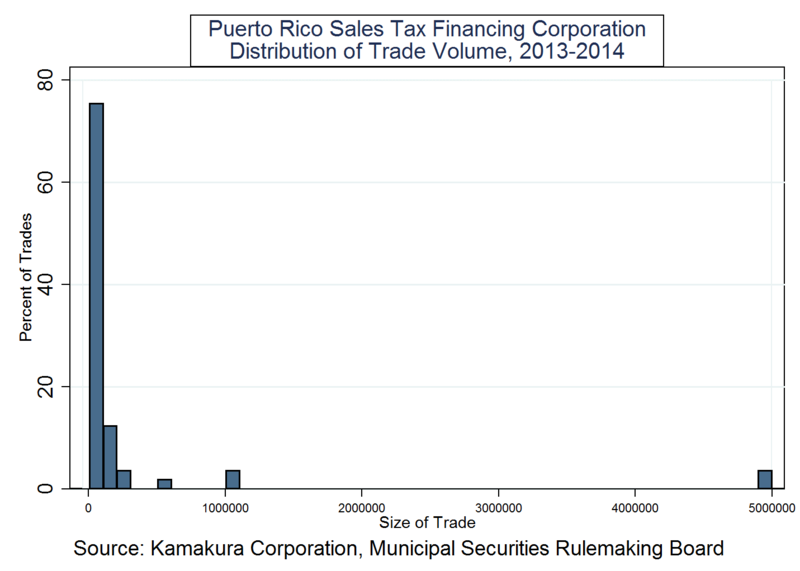 Although it is often argued that trading in Puerto Rico bond issues is dominated by hedge funds, this histogram of trade sizes since June 1, 2013 shows that 95% of trades (by trade count) are for $1 million or less in the Puerto Rico Sales Tax Financing Corporation 5.25% bonds due 2040, according to the MSRB. Note that the right hand side bar is for volumes of $5 million or more per trade. 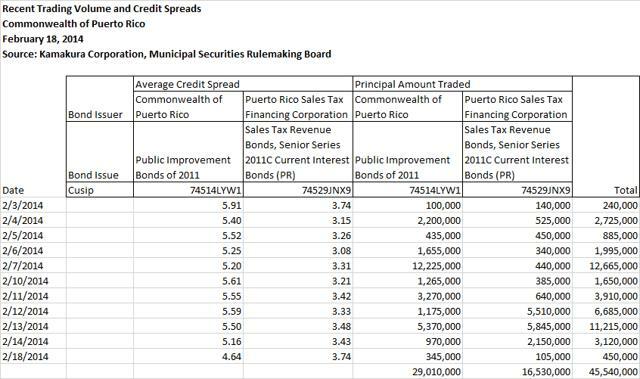 For the trades for which MSRB reports an explicit dollar trade amount on either of the two Puerto Rico bonds studied, there were 19 trades of $10 million or more during the June 1, 2013 to mid-day February 18, 2014 period. The most recent of these trades was October 30, 2013. On each day for which a trade was reported, the yields to maturity for each trade were collected from the MSRB website. The remaining maturity of the bonds was calculated and the matched maturity U.S. Treasury yield was calculated using Treasury rate information from Kamakura Risk Information Services and the U.S. Department of the Treasury. The credit spread was calculated simply as the bond yields minus the matched maturity U.S. Treasury yields. Because of the current trading levels on the bonds, we ignore the impact of early redemption in what follows. We turn now to those results. 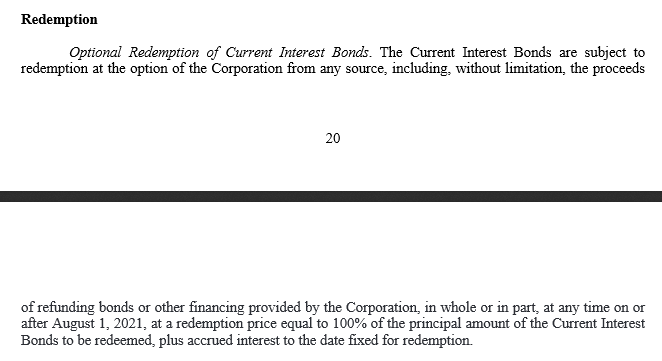 A daily summary of credit spreads and trading volume is shown below for both the 5.75% general obligation bonds due 2041 and the 5.25% Sales Tax Revenue Bonds due 2040. On relatively large volume trading days (February 7, 11, and 13) the yield on the 5.75% bonds moved from 5.20% to 5.55% to 5.50%. The daily summary given above shows that on the relatively high volume trading days (February 7, 11, and 13), credit spreads on the 5.25% bonds due 2040 moved from 3.31% to 3.42% to 3.48%. 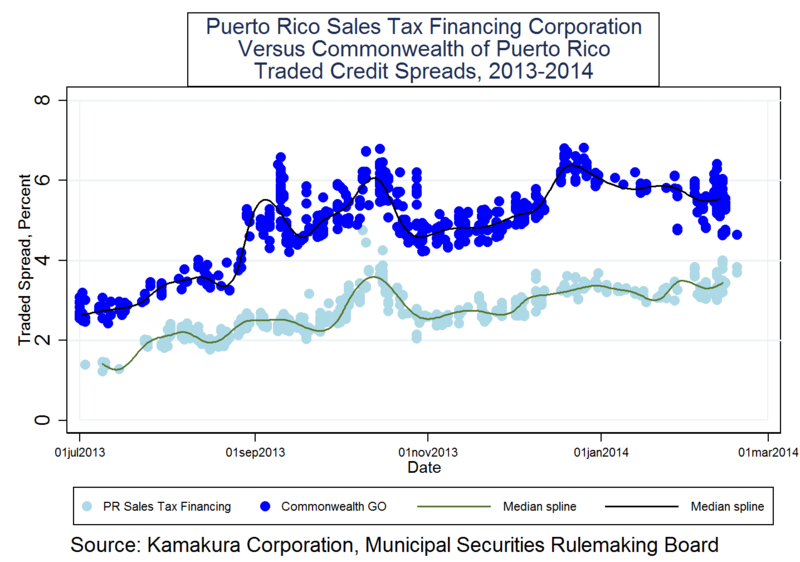 Over the full June 1 to January 28 period, the Commonwealth general obligation bonds have traded at a widening premium to the credit spreads on the Puerto Rico Sales Tax Financing Corporation, although this is obscured by odd lot trades in the graph above. On the high volume trading days summarized above (February 7, 11, and 13), the spreads between the two issues have moved from 1.89% to 2.13% and 2.02% respectively. 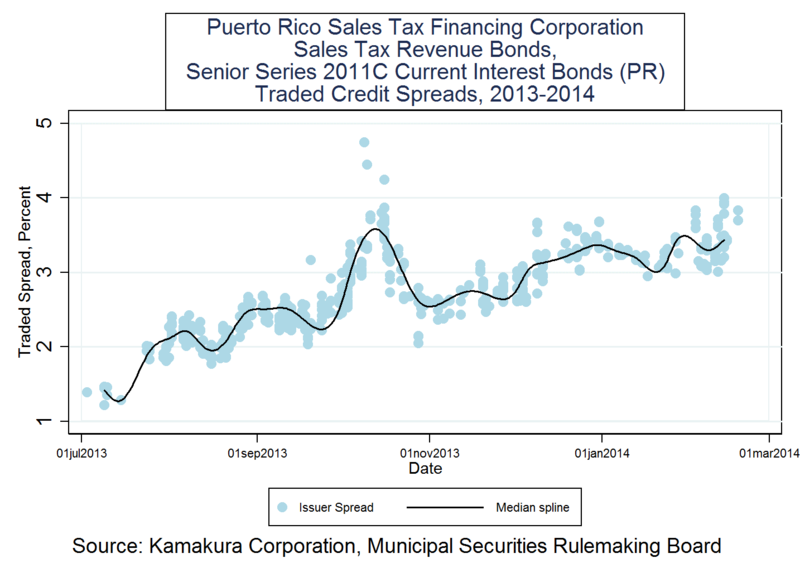 Trading in municipal bonds issued by Puerto Rico entities is not for the faint of heart. The narrowing of spreads in January and subsequent widening of spreads with higher volatility in the last two weeks show that this is a market that is best only for very well-informed investors. Many argue that such trading is now limited almost exclusively to hedge funds, but that trades of $1 million and under are the overwhelming majority of trades. 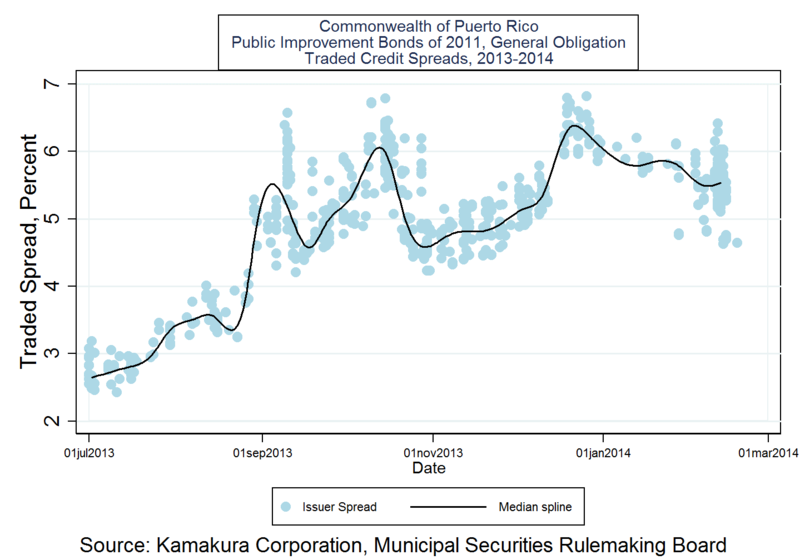 Potential investors in the municipal bonds of Puerto Rico need to do extensive analysis before executing such trades, and the EMMA website of the MSRB is an excellent place to begin such analysis. Regular readers of these notes are aware that we generally do not list the major news headlines relevant to the organization in question. We believe that other authors on SeekingAlpha, Yahoo, at The New York Times, The Financial Times, and the Wall Street Journal do a fine job of this. Our omission of those headlines is intentional. Similarly, to argue that a specific news event is more important than all other news events in the outlook for the organization is something we again believe is inappropriate for this author. Our focus is on current bond prices, credit spreads, and default probabilities, key statistics that we feel are critical for both fixed income and equity investors.